The Chinese-language version of the Pixar animation film will make its Asian premiere June 15, with "Lost in Thailand" star Xu Zheng voicing Sully. HONG KONG -- Monsters University will make its bow in China as the opening film of the Shanghai International Film Festival, Pixar announced Wednesday. In a statement on its Weibo portal -- China’s version of Twitter -- the animation studio said the Chinese-language, 3D version of the film will be screened June 15 as the curtain-raiser for the nine-day festival. Pixar also revealed Xu Zheng, the director-star of Lost in Thailand, will voice Sully in the Chinese release -- a casting coup which will drive the film’s popularity in the country immensely, given Xu’s cachet as the man behind the highest-grossing domestic release in China. The comedy took in $203.9 million (1.25 billion yuan) during its three-month run at the box office from December 2012 to February 2013. Xu is joined on Monsters University’s Chinese voice-cast by He Jiong, who will play Mike. The actor-singer has achieved fame for his 10-year stint as host of Happy Family, one of the most popular TV variety shows in the country. Interestingly, He could easily have contributed to the Arabic version of the film -- the 39-year-old majored in the language at the Beijing Foreign Studies Universities and worked as a teacher before beginning his showbiz career. 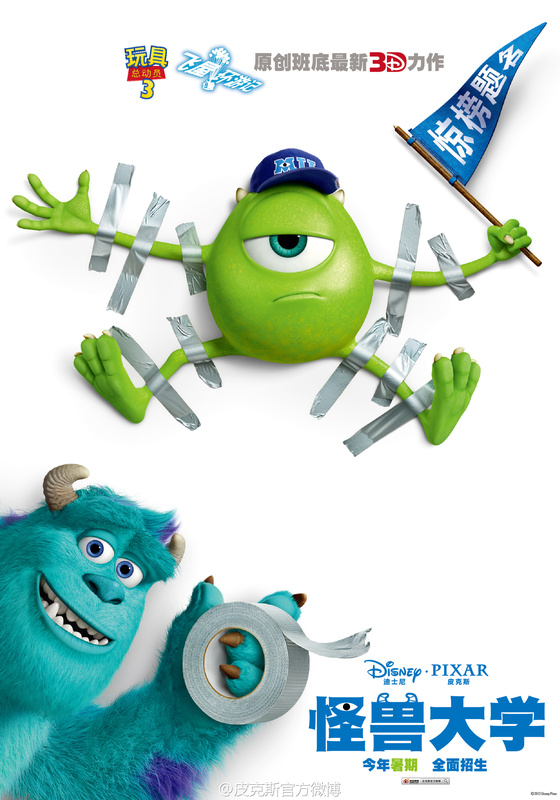 The premiere adds to Pixar’s major publicity blitz in pushing Monsters University in China. A collection of the animation studio’s previous short films will be shown during the festival, while a Chinese trailer was released online and a special poster wishing Chinese high-school students good luck in their forthcoming university entrance exams. Pixar has yet to announce Monsters University’s release date in the country. The film is imported into China as one of the 34 “shared-revenue” films allowed into the country every year. The film is slated to premiere at the Seattle International Film Festival on June 8, followed by screenings at the Sydney (June 10) and Los Angeles (June 18) festivals before opening in the U.S. on June 21.